The Alpinestars GP Plus R Leather Jacket has been a staple of the sport riding community for quite a while now. For that reason, they did not try to reinvent the wheel with the Alpinestars GP Plus R v2 Jacket, but rather improve an already tried and true design. The biggest change that most people will notice are the shoulder protectors. Riders have asked and Alpinestars has answered! Gone are the small polymer shoulder sliders in place of full-sized leather coated TPU guards which increase abrasion resistance and impact protection. 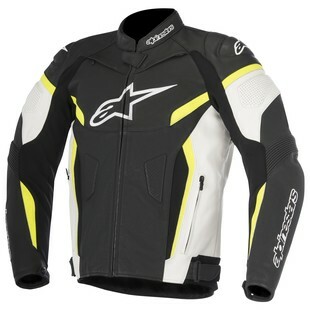 You will also notice that Alpinestars worked on improving the fit and comfort with increased stretch material. Stretch now works its way higher up along the arms allowing for better range of motion and accordion panels become slightly larger. Additionally they reinforced the construction by trimming down the amount of leather panels used. Less seams equal less weak points for the jacket to fail. Finally the ventilation scheme has ever so slightly been tweaked for better airflow. Altogether, the changes to the GP Plus R v2 are not in any way earth shattering and that is a good thing. Alpinestars realizes that they already have an excellent platform. They addressed some of the rider pain points and the result is an overall better jacket. For an additional $20 over last year's model, this jacket is on point with just the right amount of change in features for little change in price.